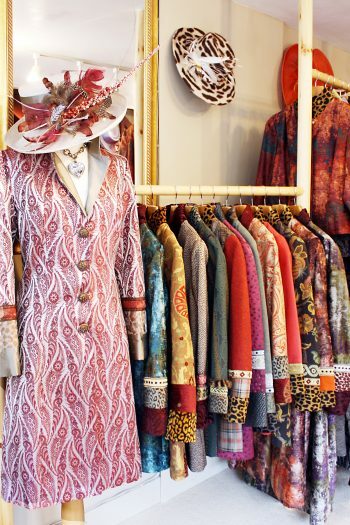 My shop is always full of coats, jackets, dresses, skirts and hats to try on and buy. Stock is constantly changing as I am always inspired by new fabrics I discover. More often thaht not these are one-off fabrics which I could keep waiting for the right person to come along. However, I can’t wait and I have to make it up. These one-off’s generally go very quickly to some lucky client who comes into the shop at the right time and it’s their size! I can keep you updated as and when I make something new. Just click this link: UP-DATES and I will email you a picture. If there is something in stock that you just have to have and it’s a bit big I can alter it. My stock sizes are 8 to 18. It is much harder however to make things bigger. You are always welcome to drop in and see what’s new. But if you do need to see me, please ring in advance. If I’m not there or working with another client I will not be able to talk to you.